Want to make your lake, river or sea neighborhoods more attractive? 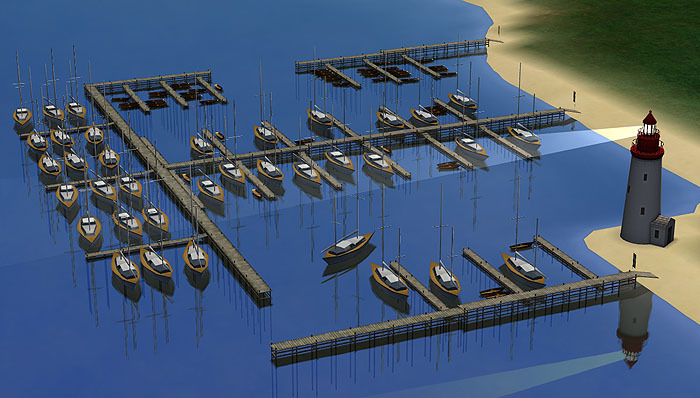 Use this simple piers and moored boats decoration set for your hoods. This set contains 9 different decorations, that are aviable under miscellaneous menu of the neighborhood decorations. 1. crqtt_marina_wood_pier_short.package - short wood pier that can be placed on the beach or the bottom. 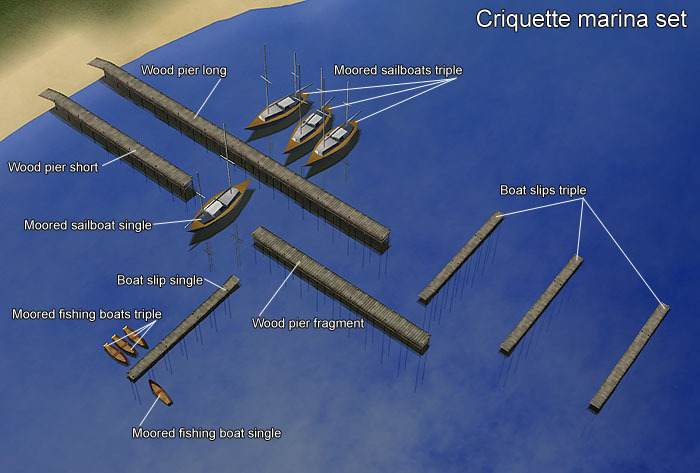 2. crqtt_marina_wood_pier_long.package - this pier can also be placed on shoreline but it's longer than the first one. 3. crqtt_marina_wood_pier_fragment.package - this is a fragment of the pier that can be placed on the water only. Just use it if you want to make your pier longer, o make an intersection of piers. 4. crqtt_marina_boat_slip_single.package - use this to create single boat slip on your pier. Can be placed on the water only. 5. crqtt_marina_boat_slips_triple.package - use this to create triple boat slips on your pier. Can be placed on the water only too. 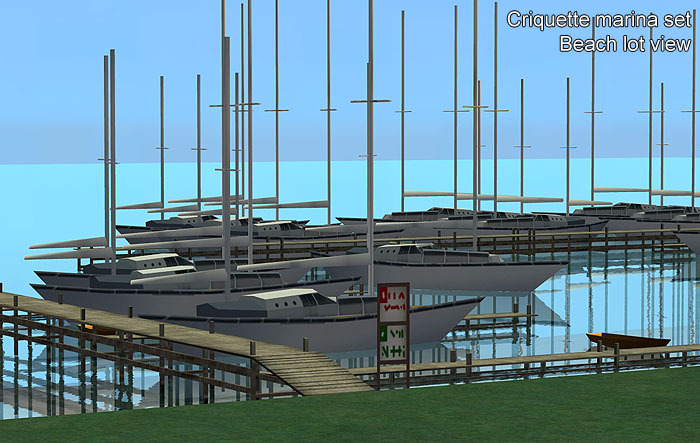 6. crqtt_marina_sailboat_single.package - this is a moored sailboat, that can be placed next to your piers. Can be placed on the water only. 7. crqtt_marina_sailboat_triple.package - three moored sailboats in one decoration. Use it if you want more boats in your marina. 8. crqtt_marina_fishingboat_single.package - fishing boat. Can be placed on the water only. 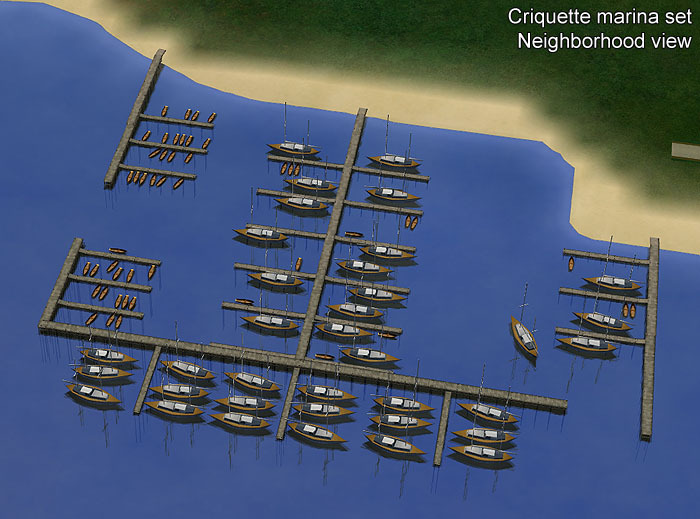 9. crqtt_marina_fishingboat_triple.package - use it if you want mutch more fising boats in your marina. To install it, just put all the package files in your downloads directory.